If 2013 wasn't going to be exciting enough with Americanah, as well as Ghana Must Go and Love is Power, or Something Like That, here are a few more books to look out for this year. Tomorrow I Will Be Twenty Years Old, a humorous and poignant account of an African childhood, drawn from Alain Mabanckou's life, will be released in May. Michel is ten years old, living in Pointe Noire, Congo, in the 1970s. His mother sells peanuts at the market, his father works at the Victory Palace Hotel, and brings home books left behind by the white guests. Planes cross the sky overhead, and Michel and his friend Lounès dream about the countries where they'll land. While news comes over the radio of the American hostage crisis in Tehran, the death of the Shah, the scandal of the Boukassa diamonds, Michel struggles with the demands of his twelve year old girlfriend Caroline, who threatens to leave him for a bully in the football team. But most worrying for Michel, the witch doctor has told his mother that he has hidden the key to her womb, and must return it before she can have another child. Somehow he must find it. 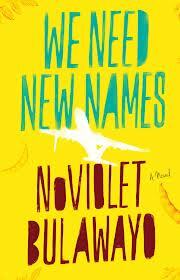 NoViolet Bulawayo, winner of the 2011 Caine Prize for African Writing, debut novel, We Need New Names, will also be out in May. Darling is only 10 years old, and yet she must navigate a fragile and violent world. In Zimbabwe, Darling and her friends steal guavas, try to get the baby out of young Chipo's belly, and grasp at memories of Before. Before their homes were destroyed by paramilitary policemen, before the school closed, before the fathers left for dangerous jobs abroad. But Darling has a chance to escape: she has an aunt in America. She travels to this new land in search of America's famous abundance only to find that her options as an immigrant are perilously few. 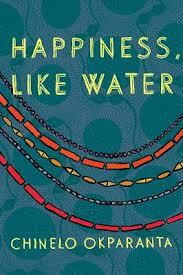 Happiness, Like Water is Chinelo Okparanta's debut collection of short stories out in August. Happiness, Like Water offers a portrait of Nigeria that is surprising, shocking, heartrending, loving, bringing us life across social strata, dealing in every kind of change. Among her characters are a young woman faced with a dangerous decision to save her mother, children slick with oil from the river, a woman in love with another despite the penalties. Their world is marked by electricity outages, lush landscapes, folktales, littered roads, Land Rovers, buses that break down and never start up again. They fight their mothers and their husbands, their own shame and their own sexuality, the power of religion and the pull of love.These are startling, challenging stories filled with language to make your eyes pause and your throat catch. Can I just say how much I appreciate your blog? I'm from and live in the Caribbean, so I love to see when blogs celebrate a cultural niche of books that aren't often celebrated. Hi Quirky, It really does mean a lot to me to read such kind words. Thank you!!! Glad you like the blog. Wow, so many new books to look out for. Thanks Bookshy! You're welcome! 2013 is going to be another amazing year of reading.